The expected in-stock date is 29 May 2019. Cord-free design enables athletes to maximize each and every workout. IPX7 Sweat & Waterproof, these buds promise to withstand your most rigorous workout and any elements thrown your way. Using unique JBL sound and mic technology, Bionic Hearing allows you to hear your surroundings with two sound Technologies – TalkThru & Ambient Aware. With TalkThru Technology, music is lowered and speech is amplified so you can easily chat with a workout partner between sets. AmbientAware delivers a more immersive music experience while increasing ambient sounds, providing the safety of hearing your surroundings. Battery life can last for 5-hours per charge, but no need for concern if you’re on-the-go. Simply recharge your earphones for another 20-hours playtime with the water-resistant, aluminum charging case. Easy-to-connect Bluetooth technology delivers a cable-free, zero-distraction performance. Winged ear tips that are easy to use for maximum security. Featuring a sleek, aluminum sliding design, the charging case has a fabric cord and ensures your headphones are recharged quickly and safely. UA True Wireless Flash offers a truly cord-free experience to push yourself further. The UA waterproof technology and Sport Flex Fit ear tips were crafted specifically for all condition training while the JBL Charged Sound was boldly optimized and tuned for motivation. 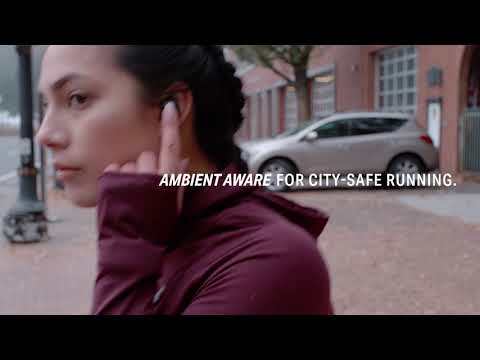 Hear your surroundings with Bionic Hearing featuring TalkThru Technology to quickly interact with your workout partner, and AmbientAware Technology to hear your surroundings for increased safety. With a total of 25 hours battery life and a durable aluminum charging case, these headphones truly break the limits. Under Armour® True Wireless Flash – Engineered by JBL® is rated 4.2 out of 5 by 35. Rated 5 out of 5 by Milesb from Great earbuds I love these earbuds. I’m a big fan of the true wireless earbuds—these in particular are great for running. I could talk with running partners while listening to my music at a low volume. I’m also aware of my surroundings while on the trail due to the bionic feature. I’m really enjoying these earbuds. Rated 5 out of 5 by DrewChalu from Amazing product! Completely game changing headphones. Far superior than Apple airpods. Battery life is significantly longer, they do a great job of cancelling surrounding noise, and they don't pick up loud background sound when speaking with someone on the phone. It is extremely difficult trying to talk to someone on the phone that is using airpods because they pick up so much background noise. I also love these while working out. They fit comfortably and don't feel like they're going to fall out when running. They also look way less ridiculous than the airpods when wearing them. Highly recommend this product. If you're debating between these and the airpods, definitely go with Flash. Rated 5 out of 5 by Jake067 from Fit great...... Jbl is always an amazing product. Collaboration with UA just promises that its for the athlete, for someone on the move that doesnt want to worry about buds falling out. They fit amazingly and the jbl sound is right on. Wouldnt buy another. Rated 5 out of 5 by Kareenawynn from Great features and adjustable pieces! Very cool features! Came with adjustable pieces in three sizes. Rated 5 out of 5 by Spencet33 from First Investment Into True Wireless I am so happy I took the risk in getting these shipped to Ireland (Via a friend), it is my first venture into truely wireless earbuds and these don't disappoint. No issues with pairing to my Mighty Audio device or Phone, the sound quality is excellent and the balance is just right to bring the music to life. The bass is perfect and gives enough of a thump to get you in the zone for runs or workouts. The fit is perfect with these, they are lightweight, I didn't have to fix them back into my ear at any stage during any of my workouts and I even forgot I had them in at one stage. (Such a difference from constanly having to adjust my wired headphones). Highly recommended! I have both. I would say that the sound quality is similar, as good as my Beats over the ear headphone. Bass is a little better with JBL. You can use the equalizer in Jabra, not in the JBL. JBL really stays in place all the time, even when running pace 4. Controls are better placed in the JBL. My guess is that if you are looking for something related to sports you should go for JBL. Is the charging port USB type C or Micro USB ? The UA True Wireless Headphones feature a Micro USB charging port. can i answer phone calls and talk on the phone with these? Yes. Press the Under Armour symbol on the right ear one to pick up, twice to hang up, and hold it for two secs to mute/unmute mic. Are you able to swim with these? IPX7 grading, which ensures 30 minutes listening at one metre of depth. I haven't tried mine in a pool yet. I would probably spend a little more time getting the correct sizing on the ear buds to ensure a tight seal before trying. Also you can't store any music in the headphones either, so you would need your phone to be within Bluetooth range. So theoretically it could work for a pool workout with your phone nearby, not open-water unless you also had a waterproof phone case attached to you. Hi! The UA True Wireless Flash do work for calls. How does this compare to the Samsung IconX 2018? What are the controls like on the earbuds? Volume, skip tracks, answers calls? Please describe all the controls the earbuds have. The right earbud controls the playback as well as accepting/denying a phone call. There is no volume control options on the headphones, the volume must be controlled by the device. Do both earbuds have a mic or just one? The right earphone is equipped with a microphone.